I was so delighted with Veni that I naturally assumed the other two scents in the series would also be excellent, so my expectations were high when I splashed on Vidi. My very first thought was, "What is that? Dill pickle? That can't be good!" Vidi doesn't exactly smell like a dill pickle, but it does have a hint of that briny tartness. And then it immediately devolves into a grim twin of those deliberately, braggingly synthetic Comme des Garçons scents such as Odeur 53, Odeur 71, and Dry Clean. The official list of notes includes such things as "ozone effects", "plastic rose", and "water effects", so you can immediately tell that it is meant to be a CdG knockoff crossed with yet another of those air-and-water men's scents that so contaminate our daily lives (I have two co-workers who wear nothing else), only even more artificial, if such a thing is possible. I think it's horrible: perhaps you'll like it better, but if you actually want to smell like this, you can find something similar (but less awful) in any department store for a whole lot less than $175. "I had no idea giving pleasure could be such a turn-on, watching him writhe subtly with carnal longing. My inner goddess is doing the merengue with some salsa moves." I defy anybody to writhe subtly. Unless perhaps she's watching subtly, which is just as stupid. And who is feeling the carnal longing? With such bad writing, it's impossible to tell, or care. The success of "Fifty Shades of Grey" spurred hundreds of equally talentless writers to try their hand at bondagey, plutocratic ladyporn for fun and profit. Go ahead. Search for "billionaire" on Amazon.com. There are hundreds of these things — thousands, probably — and most of them actually seem to be worse than "Fifty Shades of Grey", which at least presumably had the benefit of an editor (not a very good editor, mind you, not that that had any effect on sales). A sampling of chapter, book, and series titles: The Billionaire's Obsession, 31 Ways to Catch a Billionaire, Bedding Her Billionaire Boss, Billionaire Online Dating Service, Bound by the Texas Billionaire, Forbidden to Say No: The Billionaire's Plaything. 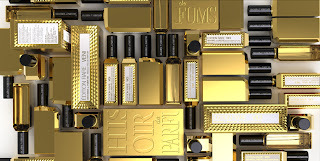 And I can't help thinking that in the main, that's what perfumery has become, too: dreadful, worthless, interchangeable, cranked out by the thousands in a naked grab for whatever money can be coaxed from the hands of the ignorant. If they're not being generated by a computer algorithm, as music is now being, according to Automate This, they could be. They might as well be. Last weekend at the mall, while Jim browsed in the men's clothing department, I decided to take a quick tour of the fragrance department, just poke around and see what's new: it's been a while. As I sampled bottle after bottle indiscriminately from the men's and women's departments, I became increasingly dispirited, because there wasn't a single thing worth wearing or even thinking about, not one. They were all predictably the same: vague, sugary synthetic fruit atop indefinite florals and gourmand notes for the ladies, bright sharp aquatic sport scents for the gents. I decided to smell a few from the Estée Lauder line to cheer me up, but even that has been denatured to bring it in line with modern, lowest-common-denominator tastes. I knew Knowing had been ruined — once a dazzling floral chypre, it's now largely synthetic oakmoss — but Spellbound too has been mucked around with: six years ago it was still a reasonable approximation of its old self, but now it's been simplified, dumbed down. French perfume house Histoires de Parfums doesn't sell in North American department stores: their offerings are strictly niche. (This is no guarantee, of course, that their scents are different from or better than anything you could buy at the local drugstore.) They started out in 2000 with a number of scents inspired by historical figures and named after dates: 1876 was the birthdate of Mata Hari, 1740 of the Marquis de Sade. 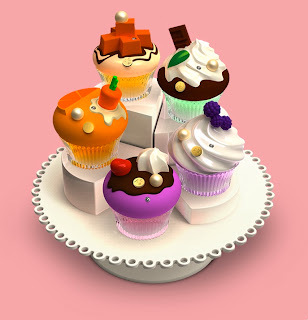 They've also recently created a series of cheeky gourmands in cupcake-shaped bottles, and admit it, you're plotzing from the cuteness, right? Even I am, and I'm so far from the target market that I might as well be on another planet. is called Veni, Vidi, and Vici*, after Julius Caesar's famous description of his win at Zela: "I came, I saw, I conquered." Naturally, I had to try them, and naturally, I had to try them in order. When I first smelled Veni, my very first thought was, "Oh, thank god." Because it's actually good! Because it's not's a terrible cookie-cutter men's scent. Because it doesn't smell like every other thing currently on the market. (At $175, it had better not.) It isn't absolutely perfect, but it is excellent, miles beyond anything you can smell in most department stores. Typical perfume-house silliness, unfortunately, but that doesn't diminish Veni's general excellence. Although the house does not admit to one particular ingredient, Veni smells primarily of coffee to me: after a bright flash of herbal lavender and spices, it settles down to a warm, slightly sweet coffee-wood scent, sturdy and durable, profoundly masculine. Hours and hours later, it's still going strong. I don't think I need a bottle of this, because I already have a number of coffee scents (I adore Bond No. 9's New Haarlem, and Pure Coffee gets a lot of wear), but don't let that stop you from trying it and buying it. Julius Caesar...set the memorable Latin sentence, "Veni, Vidi, Vici," which the Romans, who were all very well educated, construed correctly. The Britons, however, who of course still used the old pronunciation, understanding him to have called them "Weeny, Weedy and Weaky," lost heart and gave up the struggle, thinking that he had already divided them All into Three Parts. You and I are not going to pronounce the name of a fragrance "Weeny", are we? No, we are not.